Located on a secluded peninsula in Montego Bay, this resort offers Jamaican hospitality to ensure that all guests have a welcoming stay. 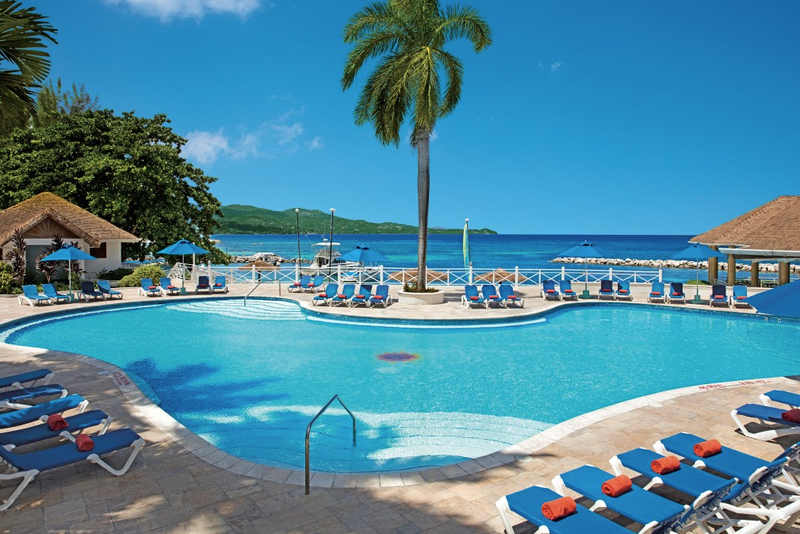 Sunscape Montego Bay is best for those who want a thrilling and adventurous wedding, whether it be sliding down waterslides, hitting the lazy river, or participating in nearby excursions! You can even host your wedding ceremony at the Pirate’s Paradise Water Park wedding gazebo. The resort is located within the Montego Bay Marine Park, Jamaica’s first and only underwater national park, including protected swimming areas and amazing snorkeling opportunities. Double your wedding as a fun vacation at this resort! The Pirate’s Paradise Water Park features a full-size pirate ship and fort, a 40-foot pirate’s plank bridge, a lazy river and a pair of 250-foot waterslides. The Explorer’s Club offers the opportunity for kids to camp out and sleep in tents weekly at the club or on the beach, with parent’s permission. Sun Club level guests will have full exclusive access to neighboring resort, Sunscape Cove. The base price for this package is $899, but complimentary when booking a minimum of 5 rooms for 3 nights, or 7 nights in the Deluxe Oceanfront room category. Upgraded packages, additional guests, and add-ons are available for an additional cost. Garden Gazebo – 150 guests max, Beach – 100 guests max, Pirate’s Paradise Water Park Gazebo – 10 guests max. The resort will host no more than 4 weddings per day, Monday thru Sunday. Ceremonies can be held at 11am, 1pm, 3pm, and 5pm, so all ceremonies can be held separately. The wedding coordinators typically respond within 24 hours. During the resort’s busy season, they may take up to 48 hours, or longer. Rooms range from $115 – $170 per person per night. Every room includes a minibar. 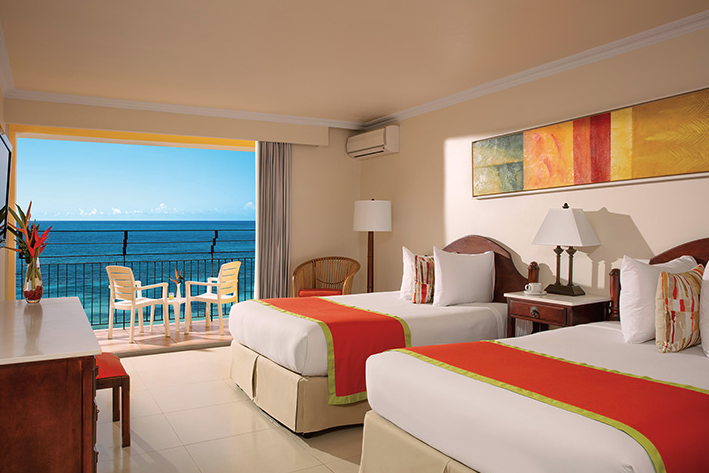 The deluxe oceanfront room categories include an oversized balcony directly facing the beach. Certain rooms in the family suites room category will offer bunk beds. Children 2 and younger stay free. There are 308 total guest rooms with views of the ocean, garden, or pools. 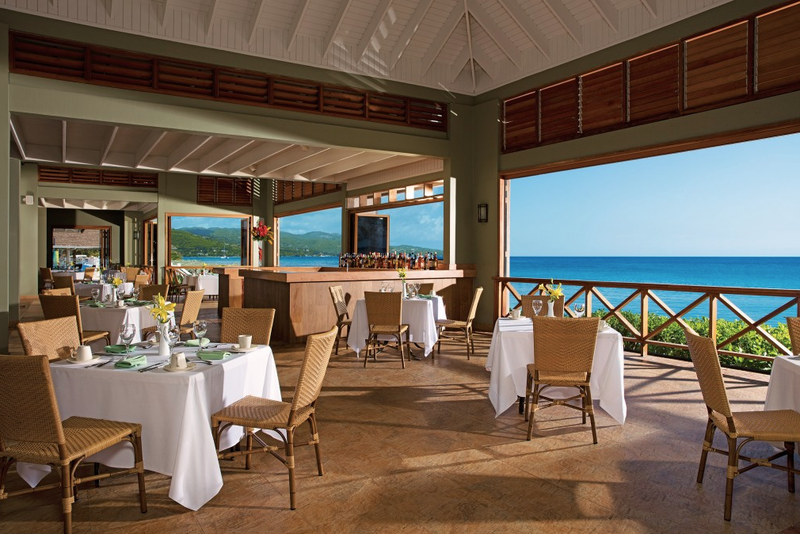 Deluxe bay room categories offer views of the city vistas and cruise pier, and the deluxe ocean view room categories offer views of the Montego Bay Marine Park. Connecting rooms are available upon request. The hotel is handicap accessible. High-season months typically include June, July, August, October, and November. It is always encouraged to have your guests book their stay 6 – 12 months in advance. All rooms allow up to 2 adults and 2 children max, or 3 adults. Children are 12 and younger. Sunscape Splash is located about 5 miles from the MBJ airport. The resort is about 10 minutes outside of downtown Montego Bay. Sunscape Splash is located 5 miles from the MBJ airport. The resort is about 10 minutes outside of downtown Montego Bay. 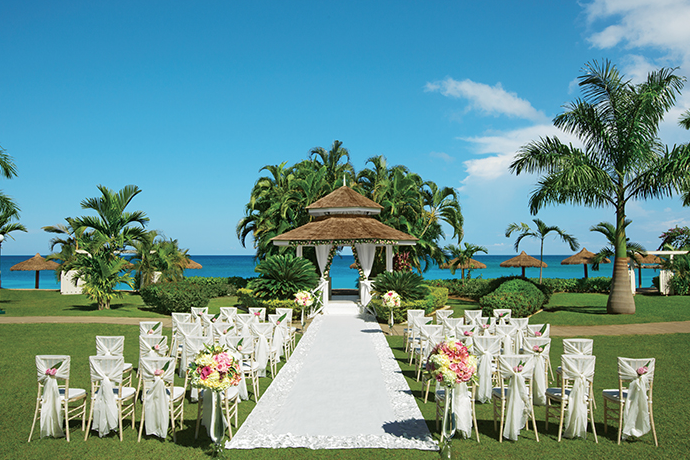 Q: What makes Sunscape Splash Montego Bay such a great place for a destination wedding? 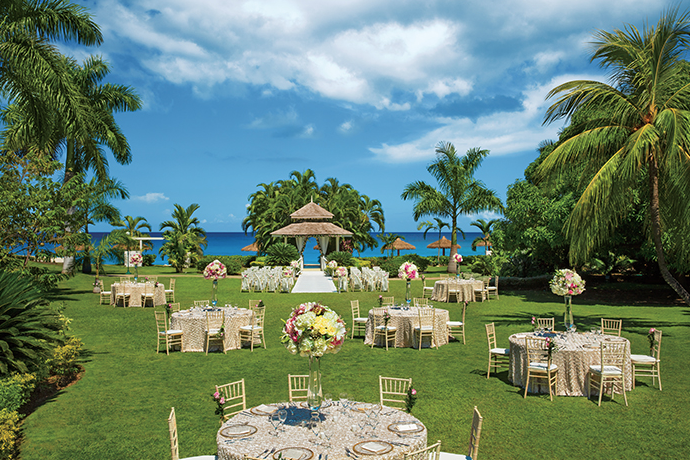 A: The spectacular wedding locations we have throughout our gorgeous property, which provides panoramic views of the Caribbean Sea and boast the perfect back drop for any wedding functions. Our delicious food and beverage options provides a variety of both Jamaican and international cuisine that are very appealing and delicious for everyone to enjoy. We pride ourselves in providing excellent services the moment guest arrive, and greet with a warm Jamaican smile, tropical welcome drink, and friendly hello from our bellman! Q: What compliments do brides typically give about Sunscape Splash Montego Bay? A: Our top three compliments that past brides have stated about our resort are the Phenomenal wedding services, excellent food and beverage options, and the stunning wedding locations. Q: A groom had cold feet and walked away from the altar before the Bride arrived. I caught up with him, got his favorite drink from the bar, and walked him to the far end of the beach. We spoke about things he liked, what he does for fun, and then led him to speak about him he met his Bride etc. He was then reminded of the reason he fell in love with his Bride and why he wanted to marry her.